I’ve been in the mood for Pinot Noir lately and usually that means Burgundy or Willamette Valley, Oregon. 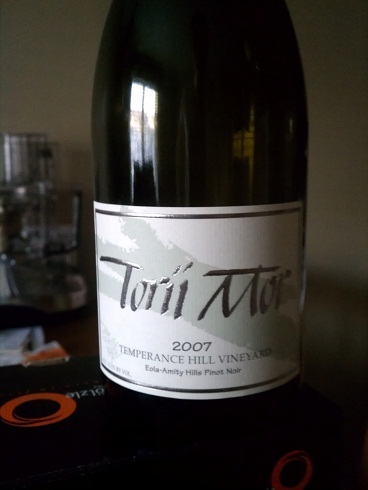 We’re headed to Oregon for this bottle of Torii Mor Temperence Hill Pinot Noir. Torii Mor’s winemaker is a Nuit Sant Georges Burgundy transplant so it’s no surprise his wines are balanced, delicate, and elegant. At $35 a bottle it’s a fairly expensive American Pinot Noir but it’s a treat worthy of splurging. colonelgrape: 93. I’ve yet to be let down by a Willamette Valley Pinot Noir. I thought this particular wine really emphasised the terrior of the area. There was a great balance of red raspberries, a hint of dark fruit, minerality, earth, and a unique ash flavor I’ve never tasted. I couldn’t put my finger on that flavor so I looked it up and apparantly that’s a hallmark flavor of the particular area where the vineyard is located in Willamette Valley. It was all held together nicely with just the right amount of acid. I think the ash flavor was just slightly more than I would have liked otherwise I’d be giving it a mid 90’s score. I think it’s worth trying just to experience that taste alone…it’s clear that thought went into making this wine. MobyGrape: 89. Sometimes I have a problem with pinot noir. I’m not sure why, but it’s kind of like the kid in class that rubs you the wrong way because they try too hard. I don’t know what it’s trying to be, but I just want to tell it to calm down, you’d have more friends if you weren’t such a spaz. I really enjoyed this one, much more laid back than other ones we’ve had, works well with a lighter meal or alone. I think I’ll stick to west coast surfers for a while until the Colonel sneaks a French one in again. This entry was posted in Oregon, Pinot Noir, United States, Willamette Valley on March 21, 2013 by colonelgrape.